$41.050 million on 3049 screens. Because horror movies tend to cost little to make, they don’t require major box office bucks to generate sequels. That was the case with 2011’s Insidious, a film whose $54 million US gross doesn’t sound great – until one considers that it came with a miniscule $1.5 million budget. This ensured the existence of a sequel, which we got via 2013’s Insidious: Chapter 2. A flashback to 1986 shows us that a specter follows Josh Lambert (Garrett Ryan). At the request of his mother Lorraine (Jocelin Donahue), paranormal investigators led by Elise Rainier (Lindsey Seim) discover that Josh can communicate with spirits in his sleep. To “cure” this, Elise makes Josh forget his powers in the hopes this will suppress the use of those abilities. Back in the present day, we re-encounter adult Josh (Patrick Wilson), his wife Renai (Rose Byrne) and their kids Dalton (Ty Simpkins), Foster (Andrew Astor) and baby Kali (Brynn and Madison Bowie). Josh saw his supernatural powers reawakened in the first film, and Chapter 2 picks up on their story immediately after those events. Elise (Lin Shaye) attempted to help the family again back then – and wound up dead, a demise that authorities think may have been at Josh’s hands. While the police investigate, the Lamberts live with Lorraine (Barbara Hershey) and attempt to cope with the aftermath of the traumatic events. Renai seems to find it more difficult to do so, though; while Josh wants to put the past behind them, Renai thinks the evil continues to haunt them. And she’d better be right or this wouldn’t be much of a horror movie, would it? I wasn’t wild about Insidious, so I can’t say I entered Chapter 2 with great expectations. Still, I can find some positives in it. For one, I like the theme that expands on the family’s story. It’s interesting to follow up on folks who went through traumatic events and see how life progresses after those finish. Of course, this isn’t a case study in “how to survive stress” – it’s another horror movie with its own terror – but I think it’s cool to trace the reactions to the actions from the earlier story. I also like the law enforcement side of things. After all, given all that happened in the first movie, there would need to be some follow-up from authorities, so that aspect of Chapter 2 contributes a sense of reality to the proceedings. Otherwise, there’s not much here to take this beyond the usual ghost story scare elements, though I think Chapter 2 feels more creative than the original. In that one, we got a first half that ripped off Paranormal Activity and a second half that took from Poltergeist. The package still provided occasional thrills, but the derivative nature of the material robbed it of much impact. While I can’t claim Chapter 2 boasts a ton of power in its own right, at least it feels more like its own movie and not just a copy of others. Too bad it tends to go off the rails during its second half. As we delve further into the events that influenced/affected Josh in the past, the movie rambles and takes us toward a variety of scenarios. These don’t come together particularly well, so the film seems somewhat disjointed and not especially coherent. That ultimately leaves it as a collection of “boo” sequences in search of a narrative. The actors give it their best shot, and the movie occasionally shows some signs of life, but those don’t become enough to create a memorable horror experience. 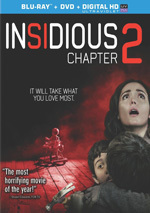 While I probably like Chapter 2 more than the original Insidious, it remains a pretty mediocre effort. 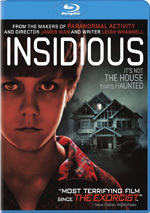 Insidious: Chapter 2 appears in an aspect ratio of approximately 2.40:1 on this Blu-Ray Disc. The movie boasted a generally positive presentation but not a great one. For the most part, sharpness seemed good. The image could be a little soft at times, usually due to the combination of digital video cameras and darkness; those were the elements that could seem a bit tentative. Overall clarity remained solid, though, and the image lacked problems like jaggies, shimmering and haloes. No print flaws marred the presentation. Like virtually all modern horror flicks, Chapter 2 went with a stylized palette. We got a chilly teal most of the time, so don’t expect anything dynamic. These tones suited the movie. Blacks were reasonably dark and dense, and shadows were acceptable; low-light shots could be somewhat murky, though. This wasn’t a great image, but it was acceptable. As for the DTS-HD MA 5.1 audio, it offered a fairly typical horror movie soundscape. This meant a lot of creepy atmosphere and occasional “jolt moments”. Along with good stereo music, the soundfield was able to open things up in a satisfying manner that embellished the story; the mix didn’t dazzle, but it worked fine. In terms of extras, we get a collection of featurettes, Peripheral Vision: Behind the Scenes lasts 15 minutes, 23 seconds and offers comments from director James Wan, writer/actor Leigh Whannell, costume designer Kristin M. Burke, production designer Jennifer Spence, property master Thomas Spence, and actors Patrick Wilson, Rose Byrne, Angus Sampson, Ty Simpkins, Lin Shaye, Steve Coulter, and Barbara Hershey. “Vision” looks at story/characters and the expansion of the first film, Wan’s approach to the material, cast and performances, visual design and costumes, sets and props, and some general thoughts. “Vision” acts to promote the film to a degree, but it still covers a good variety of subjects. That allows it to become a quality program. With Ghostly Transformations, we get a seven-minute, 19-second piece that includes notes from Wan, Whannell, makeup department head Eleanor Sabaduquia, and special makeup effects department head Justin Raleigh. The show examines the makeup techniques used for the ghosts and other affected characters. The participants go over the elements in a satisfying manner. We focus on the screenwriter/actor in Leigh Whannell’s Insidious Journal. This seven-minute, 44-second program lets us see Whannell as he wanders the set and discusses his experiences. The piece lacks real insight, but it becomes a fun little collection of behind the scenes bits. During the eight-minute, 51-second Haunted Hospital: On Location, we hear from Wan, Whannell, Sampson, and LA Paranormal Association’s Layla Halfhill and Brian Patrick. We learn about a supposedly haunted location and its use in the film. The emphasis on the paranormal aspects of the set makes this an unusual piece and reasonably interesting. Work in Progress: On Set Q&A goes for 23 minutes, 30 seconds and features Wan, Whannell, Wilson, Hershey, Byrne, Shaye, and producer Jason Blum. We learn about story/characters, cast and performances, comparisons with the first movie, and a few other thoughts about the production. Given that the chat occurred mid-shoot, no real revelations appear, but we get a mix of decent thoughts about the film; those are enough to make the program worth a look. Finally, the three-part Spectral Sightings runs 12 minutes, 19 seconds and gives us a short film with the Specs, Elise and Tucker characters. These appeared as a web series and show events prior to the first Insidious. It doesn’t offer anything scintillating, but it’s a fun way to see more of these supporting roles. The disc opens with ads for Pompeii, Cold Comes the Night, Ice Soldiers, Elysium, Insidious and Last Vegas. These also appear under Previews, but no trailer for Chapter 2 pops up here. While not a bad horror film, Insidious: Chapter 2 does little to elevate the franchise or genre. It has some good moments but tends to be too scattered and not especially scary. 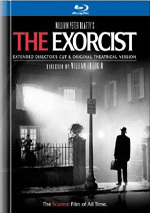 The Blu-ray provides mostly positive picture and audio along with a roster of moderately informative supplements. I suspect fans of the original will like Chapter 2 but it seems unlikely to convert new viewers.